Are you vegan, vegetarian, or just curious about eating a more plant-based diet? 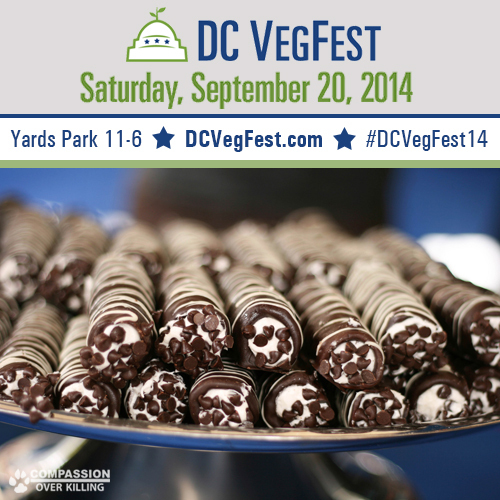 Then this year’s DC VegFest on September 20th is not to be missed. Held at beautiful Yards Park on the DC waterfront, DC VegFest is a free day-long celebration that includes speakers, cooking demos, more than 100 exhibitors and vendors, a “Barking Lot” where four-legged furry friends can romp, music, and much more. This year’s keynote speaker is Robin Quivers–also known as Howard Stern’s sidekick–and author of The Vegucation of Robin. Washington Post writer and author Joe Yonan along with Doron Petersan of Sticky Fingers Eats and Treats are on tap to do cooking demos featuring easy-to-make vegan dishes the whole family will enjoy. More than 25 restaurants will be showcasing their healthy eats at the festival, ranging from kombucha from Craft Kombucha and freshly pressed juice from South Block Juice Co. to vegan Chinese food from Vegetable Garden and vegan pizza from Pete’s New Haven Style Apizza. Those looking for refreshments a little harder than juice can even take advantage of the beer and wine garden, sponsored by Bread & Brew. Other exhibitors not to be missed will include all-natural skin-care lines, yummy baked goods, organic dog treats, and even a local culinary arts school specializing in healthy, plant-based diets. DC VegFest highlights the many benefits and flavors of vegetarian eating and shows how easy and delicious it is to choose healthier, more sustainable, and kinder foods. Attendees will enjoy free food samples from So Delicious, Tofurky, Larabar, Way Better Snacks, and more as well as tasty vegan cuisine from nearly two dozen food vendors. Attendees will also have the chance to peruse exhibitor booths from such animal-friendly organizations and companies as Dr. Bronner’s Magic Soap, the Humane Society of the United States, Conscious Corner, A Well-Fed World, Animal Rescue Bar, Washington Humane Society and many more. In addition to this event being free and open to everyone, the first 1,000 attendees will also get a free 2014 commemorative DC VegFest tote bag loaded with veg-friendly products, coupons and more! The DC VegFest was originally founded by the Vegetarian Society of DC and has been organized by Compassion Over Killing since 2009.